The New Visco-Elastic Foam models are widely considered to be the best models McCarty's has made to date. Combining their unparalleled support technology with today's latest and greatest visco-elastic memory foam has made these models stand out as the best of the best. Having been in the making for over 60 years, the McCarty's Sacro-Ease has become a fixture in the world as one of the most effective back supports available today. 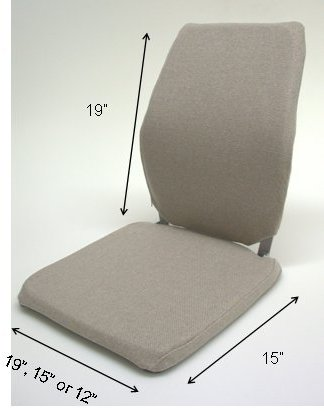 With the introduction of the comfort memory foam, in addition to their traditional steel frame and rubber construction, the models BRCCF, BRSCMCF and BRNCCF have risen to the top as the best models McCarty's offers, and quite possibly the best seat support made anywhere in the world. Used daily by truck and taxi drivers, on buses, airplanes, boats, or just driving anywhere, the McCarty's Sacro-Ease works.